So, gear nuts, riddle me this! What do you do when you’re trapped in a gear landscape of yesteryear and most of the effects pedals you plug into just aren’t inspiring you anymore? You do what Brian Wampler did, and launch your very own boutique pedal company, then innovate and create some of the most interesting and unique designs on the market. Wampler has been making pedals under the founder’s namesake for about a decade now and interestingly, one of his testing criteria is the pedal prototypes get played live before they’re sold and marketed. This is a great approach, as too often, what starts off as a great idea doesn’t always translate into a desirable product. 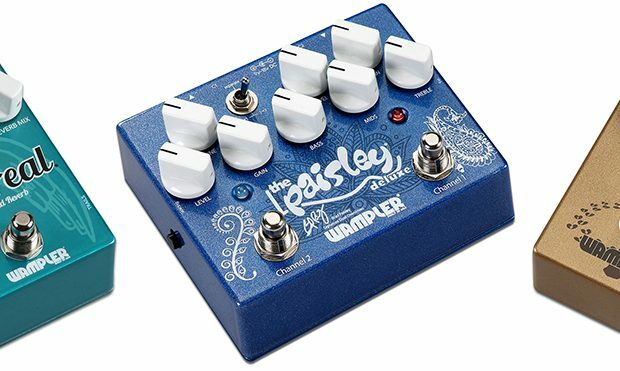 Wampler designs are reliable and useful.Wampler’s designs have made their impression upon superstar players, and country artist and axe slinger, Brad Paisley, collaborated with Brian Wampler on a signature pedal, the Paisley Deluxe. We received the Paisley Deluxe and Tumnus Deluxe — two capable overdrive/preamp pedals, and the Ethereal, a combination delay/reverb pedal. None of them have been returned to Wampler since writing this review, but we’re getting ahead of ourselves now, aren’t we? The common features between the three Wampler pedals we are reviewing are ¼” in and outs, 3.5mm power adapter connectivity, relay style switching, and solid metal construction. All pedals are designed and made in America. The Ethereal is a single sized stomp, providing delay and reverberation in a compact footprint. On the face of the Ethereal is a Carling-style relay footswitch. The Ethereal offers true bypass operation or buffered. Sitting on the lower right side of the pedal is a Trails mini button, which is used to either allow or defeat the effects spillover once the pedal is deactivated (when activated, the pedal is buffered). Five knobs are found on the face of the pedal, consisting of Feedback, Tone, Delay, Delay Mix and Reverb Mix. Although delay and reverb mix are self explanatory, on this pedal the mix knobs are never 100%, so they never completely wash out or replace the original signal. The Tone knob is used to, you guessed it, shape the overall tone of the effect (or effects) dialed in. The Feedback knob is used to both add or subtract repeats of the delay as well as reverb decay. Yes, it will go into oscillation if applied too liberally (somewhere past 3:00). The Delay knob sets the delay time, with the printed spec being between 20ms (a slap back feel) to a full second of delay. There is a lamp right next to the knob that enables you to visualize the delay time. We have found a full second to be the baseline acceptable, upper limit on delays, as other analog style delays have fallen short of this. We like a second or better. The Ethereal delivers. The last switch on the pedal is a Delay Mode mini-style switch, which controls how the delay repeats happen. The Ethereal always has a quarter-note repeat. With this switch, you can select an additional eighth note, a triplet, or an additional quarter and eighth note, which will cross feedback, creating a more soundscape-ish, big, open space, type of effect. There are no advanced delay options like reverse, tape, dynamic, etc. For reverb, it can go from tight room sounds to huge cathedral type spaces, and you can vary the tone of that fairly well. As a delay effect, features are somewhat limited. If we could wish for one more feature, it would be to allow for an external tap tempo. 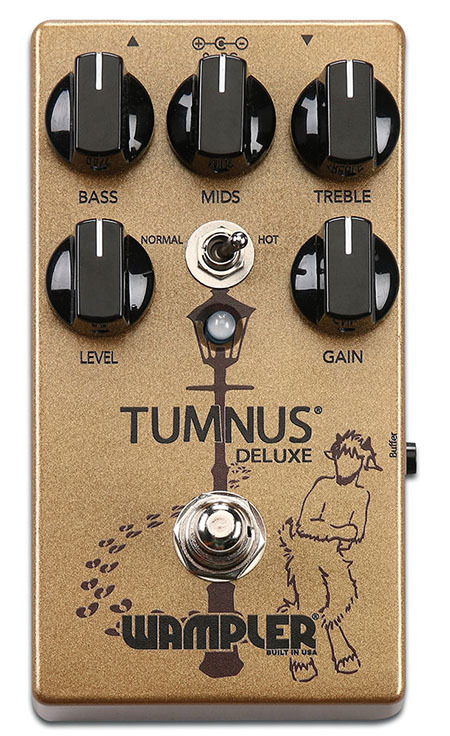 The Tumnus Deluxe starts off with the same familiar controls most of our amps have. The five knobs adorning the face of the pedal are Gain, Level, Bass, Mid, and Treble. There is also a Normal/Hot switch, an LED lamp to indicate if the effect is engaged, and a relay-type footswitch. A button on the side of the pedal enables you to select buffered or true bypass operation, making this an excellent choice for most boards with other effects that may be sensitive to a buffered signal (like some wah pedals, for instance). The Paisley Deluxe was a bit more feature packed than the Tumnus, given it is primarily two pedals in one with various routing capabilities. 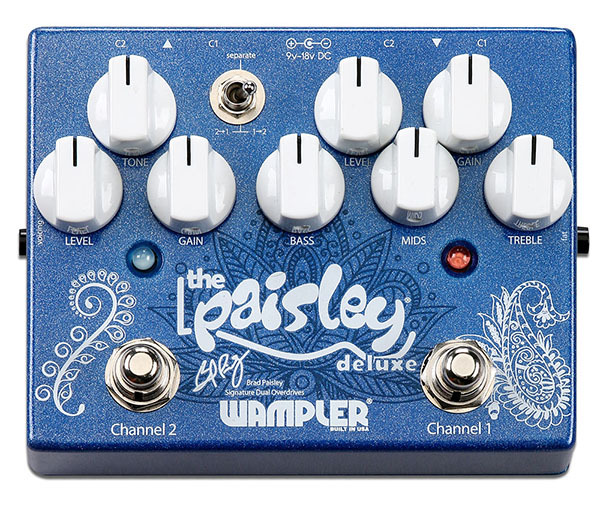 Channel 1 is a faithful recreation of Mr. Paisley’s favorite, the Wampler Underdog pedal. Controls are similar to the Tumnus as well, though there are additional controls on this pedal. A Fat switch, located on the Channel 1, right side of the pedal, adds a gain boost as well as an EQ curve change. Both Channel 1 and Channel 2 inputs are found on this side of the pedal as well (more on the switching and how this works later). Channel 2, located to the left, is a refined Wampler Paisley Drive, with just Level, Gain and Tone controls. A blue lamp is used for this channel, as opposed to the right half’s red lamp. The output jacks are located on this side of the pedal, labeled C1 and C2. A Voicing switch is found on the left side of the pedal and adds a mid boost. This is where things get interesting: A three-way toggle is found in between the two channels, providing stackable routing capabilities. The toggle is labeled 2>1, 1>2, and Separate. It’s important to read the manual, otherwise you’ll hear nothing at all depending where you have this switch set and how you have the pedal ins and outs connected. All Wampler pedals reviewed were connected to power with a 3.5mm 9v center-negative adapter. The mA draw on each of the pedals were reasonable, making our most basic, cheap-o amazon.com sourced, ten dollars adapter more than adequate to provide power. We do wish the Ethereal and Paisley Deluxe (to a lesser extent) pedals had some basic MIDI functionality for easy integration into big rigs. Luckily, our RJM PBC audio looper/switcher was well suited and up to the task of handling the job of on/off operation. There is no printed spec for just how hot the mix gets, but our ears put them somewhere around 50% max. Parallel loops be damned, this pedal needs a series loop for best use. Some comb filtering is almost a certainty when100% wet or kill dry are not possible. The Tumnus was as simple as possible to get in the fight. We connected to power, connected input and output and we immediately made use of the relay type switch to activate/deactivate our distortion. Our review pedal even shipped with a battery. The Paisley deluxe was a bit more of a balance and required a quick read through the online material to gain a full understanding of what it does. Given the tonal options of this pedal, coupled with its flexible routing, this fact is understandable. Our first attempt at plug-and-play shamefully produced no sound. After reading the manual, it became obvious this was pilot error. Fortunately, we aren’t flying airplanes. Once we gained a thorough understanding of the routing capabilities, we were up and running fairly quickly. We did find a slight learning curve getting both channels to play nicely with one another, but we also feel in this mode, the pedal shines the best and really shows off its capabilities. Gain stacking is everything in getting the most out of the Paisley Deluxe, and “just enough” turns easily into “too much” with a nudge of the wrong knob. We first connected the Ethereal to our Fender ‘57 Pro Reissue combo amp and set all knobs at about 12:00, choosing our trusty Knaggs Doug Rappoport Kenai for this sound test. Due to the style of music we typically find ourselves playing, using a time-based pedal with an amp that has no effects loop was unconventional for us to say the least. Almost exclusively, we’d previously tested and set up all time-based effects after an amp’s preamp section. That said, we loved the Ethereal in front of this amp! The delay and reverb were a bit of a balancing act to get right, but once the reverb was dialed back to about 9:00 and the delay to about 11:00, the effects were at a point where they sounded lush, hi-fi, and full. The reverb in particular when tested alone (with the delay mix at zero) had a beautiful three-dimensional sound to it. Some of the repeat settings for the delay, when pushing the delay hard, had a nice, cascading feel and sound to them as well. We also tested the Ethereal at a band rehearsal and used the pedal in the effects loop of a classic Marshall DSL2000. Selecting the instrument level for the loop, we mated the send and return appropriately and were instantly in business. We really appreciated what we can describe as the “light hit” of the pedal, in that the delays and reverbs, although they got well saturated, never really overpowered the original signal. Yes, we did pepper to taste, but as a utility effect in a loop, this pedal really shined and brought a stage-ready sheen to our lead work. The reverb was a bit lush, but we never felt we had to turn it off, just lower at times for better clarity on the DSL’s dirty channel. We absolutely loved the delay sound set for single repeats with the tone knob about half way. 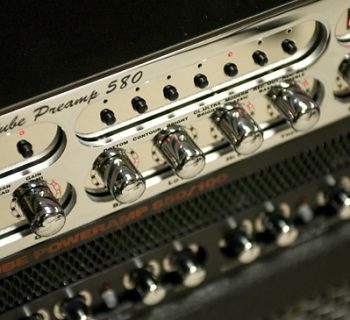 We fired up our Fender SuperSonic amp for the Tumnus sound test. 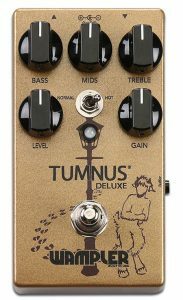 Using the clean channel, we set out to hear if the Tumnus Deluxe was a suitable amp-like overdrive solution or if it better served as a boost for an amp’s dirty channel. Grabbing our Knaggs Steve Stevens classic, which is our quintessential rock and roll sledgehammer, we set the gain to kill (full on, around 5:00), tone knobs and level around noon, and toggle switch set to Hot. Yes, we live dangerously around here! We loved what we heard coming out of the amp using the guitar’s Bare Knuckle bridge humbucking pickup. A formidable amp-in-a-box indeed, this pedal really delivered in tone, saturation, note sustain, and amp-like feel. Lead work sang wonderfully, and we never felt a fight from the pedal to get what we wanted out of the guitar. The pedal was a little on the well-mannered side in terms of feedback and noise, which we consider a good thing coming from a pedal. Pinch harmonics didn’t jump off the guitar so easily in this configuration, however. They happened, but they didn’t exactly beg to happen like some other tested pedals. At this extreme setting, we’d have anticipated a little more fight from the pedal, but that didn’t quite happen. The sound was focused, very compressed yet still very good, with a voice of its own. Switching to the neck pickup, we found the sound still quite aggressive yet attenuated in the highs as anticipated. The pedal handled this well, as it did not get muddy, even in these extreme settings. Knocking back the toggle on the pedal from Hot to Normal took a fair amount of edge off, lending itself to more of a rhythm sound, losing a decent amount of sustain but not grit. A good analogy would be taking a pot of boiling water down from a full-on boil to a simmer. We could have still burned up a track, but the toggle took the blazing fire down to a smoldering ember. 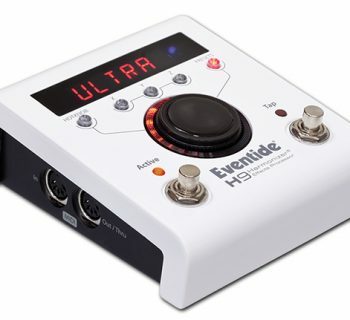 This pedal really loves the mid-range tone knob, as the sound was focused and useful throughout its range. Our ears loved the mids with a healthy 1:00-2:00 position, although a scooped mids setting with the mids backed off also sounded quite good, and also felt like we gave our ears a little bit of a break. The Tumnus was a pleasure to play, and easily became our favorite of the three in review. Overdrive pedals—and how they sound—are so subjective, it’s often hard to score in product testing. We not only consider how we like the sound, but also take into consideration the intended end user, and in this case, the actual artist who helped to conceive the product. Brad Paisley is not known for over-the-top, high-gain guitar solos, however that in no way diminishes his cutting-edge, stellar playing in his work. He gravitates to mid-gain tones at best, which happens to be what this pedal does best. We plugged The Paisley deluxe into our Fender ‘57 Pro Reissue. We sound tested each channel individually in order to form an opinion on their vastly different tones, and then tested the channels stacked, to form further opinions on how the pedal sounded with both channels used together. 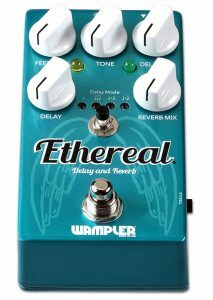 Channel 1 is a faithful recreation of the discontinued Wampler UnderDog pedal, which Brad Paisley has several examples of. We plugged our Fender Johnny Marr Jaguar into channel 1 to see what kind of single coil snarl we could get out of this pedal and amp configuration. We were sure glad we did! The Bare Knuckle pickups here with the gain about midway on the pedal, as well as the level set to unity (this is very important for this particular amp, due to the fact the Fender ‘57 Pro reissue only gets dirty by itself at the loudest settings), sang with organic and open-sounding tone. We didn’t care for this pedal’s Channel 1 for higher-gain settings (we much preferred the Tumnus Deluxe), however mid-gain settings were wonderful. The Treble knob lent the perfect amount of air and didn’t get too tinny for our ears. The Fat switch engaged sounded best and led to a rounder and fuller tone as we expected (this was also the case when we specifically switched to a guitar with humbucking pickups, a PRS Custom 22). Channel 2 is (basically) the Wampler Paisley Drive minus the Presence and EQ Shape toggles (however there is a Voicing button on the Deluxe version tested). We did not like this channel as much as channel 1 as a stand-alone product, but we can see why chicken pickers and country players alike would love it. There wasn’t a lot of overdrive on tap, but as a boost it lent to a natural compression that smoothed out much of what we were playing. Again, set to unity-gain level with the Gain knob at about 2:00, we achieved some decent grit, but still not late ‘70s classic rock levels of overdrive. The sound was good, but it clearly was meant for a specific application and not a mass appeal in and of itself. We far preferred this channel with the voicing switch disengaged. Things got a little thin for our taste when we switched the voicing. But this pedal encourages use of the two channels in conjunction with one another. So how did that sound? Setting the toggle to 2>1 effectively sends the Paisley Drive (Channel 2) into the UnderDog channel (Channel 1). Gain staging was everything for this sound test, as we started the test with too much gain (yes, there is such a thing, even for some of you metal heads) and things were messy. Once dialing the Level and Gain knobs back, this was our favorite sound of the pedal. 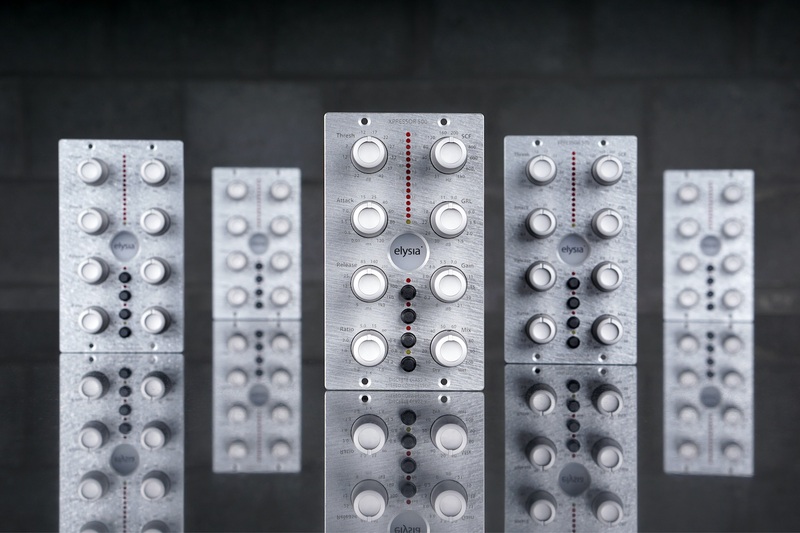 It gave us a more aggressive, yet still controllable and articulate, Channel 1 sound that we enjoyed mostly for lead tones. We did have to reset our bass, mid and treble knobs, but once we got those to where we liked them in this mode, we found this configuration to be of great value and far more mass appeal for typical players. This was a sound test that went on for at least 45 minutes, which just drifted off into noodling because we enjoyed playing the sound that much. Setting the toggle 1>2 did not yield as favorable results for us. We much prefer Channel 1 to be the finishing channel where we add our gain and final EQ, deferring Channel 2 to be the initial tone shaper and signal booster. Each pedal includes stickers (we love stickers) and rubber feet that are not applied to the pedal in advance—perfect if you intend to stick the pedals right onto a pedalboard. Also included is a velvet carry bag and an instruction manual. Wampler is very active on social media. We have enjoyed many posts featuring updated pedalboards, designs and more over the last few months. They have clearly established both a fantastic website and online presence. The Wampler website is quite extensive and you can download any manual, plus preview both current and discontinued products. Brian Wampler is very accessible and through our limited dealings with him, he is hands on and proactive. A generous five-year warranty covers both original owners and can be transferred to subsequent owners. Well done. The Tumnus Deluxe and Ethereal each sell for $199.97. The Paisley Overdrive sells for $259.97. The pricing on these pedals is more than reasonable, considering you get high quality, great sounding, USA-made products. Boutique gear typically comes with a premium price tag, but in this case, Wampler does a nice job keeping prices reasonable.